Calgary police released a photograph of homicide victim Sarah Nicole Rae in hopes that someone will come forward with information about her death. The 24-year-old was found dead in a home in the 6100 block of 4 Avenue N.E. on August 3. An autopsy revealed that Rae was stabbed to death. Police say that there were no signs of forced entry into the home where she was found and that it is likely she knew her killer. Here's hoping it gets resolved PDQ ! So my good buds over at the Calgarypuck forum have cited me with another infraction and completely pulled a thread I started about Mr. Prentice and his special sign privileges. Reason: While an interesting discussion topic, the forum isn't a place to link to your own blog so overtly like that. Posting a thread with the subject matter without a link would have been great. Well I can't deny it; yes, posting links to my blog is to drive traffic to it. Isn't that why we all blog? To get the word out to as many people as possible? Isn't that why we post on forums? To share, discuss and debate ideas? to drive traffic to them. They say that posting the entire blog entry would have been more appropriate; however I am pretty sure it would have gathered just as many complaints and likely also led to an infraction. Violation of copyright, do not repost entire articles. Please read the posted guidelines. Granted I can see the difference between my own articles and those of others. None the less, I have been using that as a guideline in subsequent postings.... in fact there have been two other threads that I started in exactly this same fashion. I did not receive an infraction on either of those; nor were the threads pulled. Clearly they are being selective about what gets debated; fair enough it is their board to do as they see fit. I will stick to boards that apply their own guidelines fairly and equally. Calgary Board of Education supports the CPC ??? As much as I love politics, I still think there are certain groups who should remain non-partisan; school boards for example. Yet nearly everyday of this federal election I am getting the message that the Calgary Board of Education supports the Conservative Party of Canada. Now they don’t have this information on their website; nor have I seen any mailers with their support. 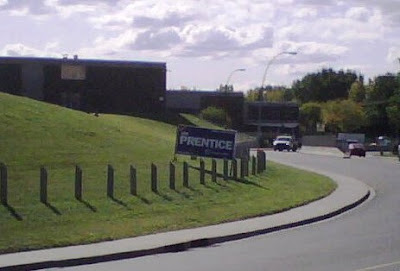 However; one of Calgary’s largest high schools has had one of Jim Prentice’s signs predominately displayed on school property for most of the campaign. This is not some small sign that an over zealous campaign worker put up without thinking. It is a sign rented from Brite Signs, the type that require a vehicle to move. They also normally have to schedule a set up and take down time. And in this case I suspect they also required permission to enter the grounds to place the sign. Realistically, I am pretty sure the agreement to place this sign on school property ended at the school level and the board is likely not even aware of it. You cannot see the name of the school in the photo, but it is James Fowler High School. It is on a prime corridor in this riding. A street; where on the opposite side, all parties suffer massive vandalism of signs. Yet this one is untouched. A search of the school’s directory will show you a NJ Prentice. Coincidence? Maybe, maybe not. Too bad my son has graduated; I always meant to ask his Social Studies teacher if she was related to Jim. The campaign statements are out and this government has proven it cannot grasp fiscal responsibility. They spent five times their fund raising and were happy to raid the rainy day fund built up by Ralph Klein supporters. The PC's believe if they spend enough money the voters will follow. The Wildrose Alliance believes Albertans cannot be so easily fooled. This government has been exposed for their excessive spending and open cheque book policies. Like the federal Liberals, Premier Stelmach now finds it necessary to put in spending gag laws to protect their interests. Just like their personal pay raises they do it in secret and behind closed doors. The Wildrose Alliance believes this is unethical. Prime Minister Steven Harper and the federal Conservatives fought against such gag laws, why is this government implementing them? The Wildrose Alliance is a party of principles and during the recent Election we demonstrated fiscal accountability to our members and Albertans. We have proven we are the fiscally responsible party and that we will respect the wealth of Albertans. Clearly, this deficit spending by the PC's underscores why they called an Election. Albertans are shutting the door on donations to the PC's and only 1/5th of Albertans voted for them. With the rising support the Wildrose Alliance is receiving from Albertans it is clear we are a threat to their self preservation and 36 year reign. The big concern we have for all Albertans is this government's budgeting. Their latest fiscal update left little room for error yet billions have been promised for environmental initiatives against millions in funding for crime and health care. Oil and Gas prices are far below even their latest economic assumptions just 2 weeks ago and threaten their budget. The PC's could not estimate oil and gas gas prices on the way up, how can we trust they'll make the right estimate on the way down? Further, when they prioritize high speed trains and carbon dioxide pipelines versus funding hospitals and fighting gangs, they've proven they are out of touch with everyday Albertans. The Wildrose Alliance focuses on the issues of everyday Albertans: a strong vibrant economy, innovative health care available to all, quality education, responsible environmental management and safe communities. Yup, double checked it is nearly 2.5 MILLION and is deficit. WRP $ 49,409.41 SURPLUS ! ! ! ! ! ! ! Remind me again; who is the "fiscally responsible" party in this province?? ?